What does an Islamic year look like? So you can’t print an Islamic calendar in advance? When will the Islamic calendar overtake the Gregorian calendar? Doesn’t Saudi Arabia have special rules? The Islamic calendar (or Hijri calendar) is a purely lunar calendar. It contains 12 months that are based on the motion of the moon, and because 12 synodic months is only 12×29.53=354.36 days, the Islamic calendar is consistently shorter than a tropical year, and therefore it shifts with respect to the Christian calendar. The calendar is based on the Qur’an (Sura IX, 36-37) and its proper observance is a sacred duty for Muslims. 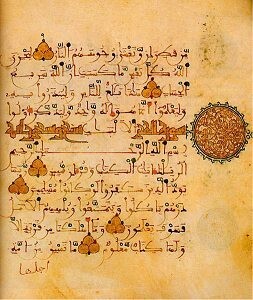 Most Muslim countries use the Gregorian calendar for civil purposes and only turn to the Islamic calendar for religious purposes. Until 2016, the Islamic calendar was the official calendar of Saudi Arabia. Each month starts when the lunar crescent is first seen (by an actual human being) after a new moon. Although new moons may be calculated quite precisely, the actual visibility of the crescent is much more difficult to predict. It depends on factors such as weather, the optical properties of the atmosphere, and the location of the observer. It is therefore very difficult to give accurate information in advance about when a new month will start. This a page from an Egyptian tear-off calendar. In the top right corner the date 10 October 2006 is given, in the top left corner the date 17 Ramadan 1427 is given. Not a reliable one. However, calendars are printed for planning purposes, but such calendars are based on estimates of the visibility of the lunar crescent, and the actual month may start a day earlier or later than predicted in the printed calendar. Different methods for estimating the calendars are used. Such a calendar would give an average month length of 29.53056 days, which is quite close to the synodic month of 29.53059 days, so on the average it would be quite accurate, but in any given month it is still just a rough estimate. Better algorithms for estimating the visibility of the new moon have been devised, and a number of computer programs with this purpose exist. Years are counted since the Hijra, that is, Mohammed’s emigration to Medina in AD 622. On 16 July (Julian calendar) of that year, AH 1 started (AH = Anno Hegirae = year of the Hijra). Islamic year AH 1441 will begin on, approximately, 1 September 2019. Note that although only 2019–622=1397 years have passed in the Christian calendar, 1440 years have passed in the Islamic calendar, because its year is consistently shorter (by about 11 days) than the tropical year used by the Christian calendar. As the year in the Islamic calendar is about 11 days shorter than the year in the Christian calendar, the Islamic years are slowly gaining in on the Christian years. But it will be many years before the two coincide. 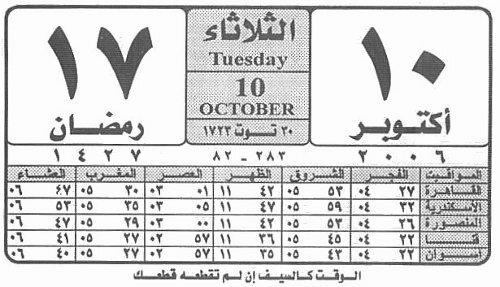 The 1st day of the 5th month of AD 20874 in the Gregorian calendar will also be (approximately) the 1st day of the 5th month of AH 20874 of the Islamic calendar. In 2016 Saudi Arabia switched to the Gregorian calendar for civil purposes. Before 2016, the Islamic calendar was the official calendar of Saudi Arabia. For civil (but not religious) purposes, Saudi Arabia didn’t rely on a visual sighting of the crescent moon to fix the start of a new month. Instead they based their calendar on a calculated astronomical moon. then the next day will be the first of a new month; otherwise the next day will be the last (30th) of the current month. The times for the setting of the sun and the moon are calculated for the coordinates of Mecca.